The Epiphone Masterbilt DR-400MCE Electro Acoustic Guitar in Natural Satin is an outstanding instrument at an affordable price. Epiphone know a thing or two about building guitars that outperform their price tag, and the DR-400MCE is another masterpiece that offers exceptional value for money. The Masterbilt DR-400MCE is shaped to the dreadnought body shape, which is a popular choice for both soloists and ensemble performers alike. Thanks to the inclusion of a single-cutaway at the upper bout, access to the upper frets is delightfully comfortable. The back and sides are built from mahogany, which establishes a powerful mid-range timbre infused with a sumptuous warmth. The top is built using solid Sitka spruce, a highly resonant wood that acts as the perfect soundboard that projects tones confidently. Fitted to the body via glued-in, dovetail neck joint is a solid mahogany neck. A solid feel is assured, whilst the 1960's SlimTaper profile maximises playing comfort. Paired with the neck is an FSC certified blackwood Tek fingerboard, which is home to 20 medium-jumbo frets with pearloid dot position inlays to guide your way. Meeting the headstock via the bone nut, each string is held securely using Epiphone vintage premium open-back tuning machines with a steadfast 18:1 tuning ratio. The headstock has the classic Masterbilt asymmetrical profile, and is adorned with a pearloid '30s era Masterbilt logo and vintage "Stickpin" inlay. The two-adjustable truss rod cover features "Masterbilt" in white, which are little finishing touches that elevate the sophisticated style of the DR-400MCE. 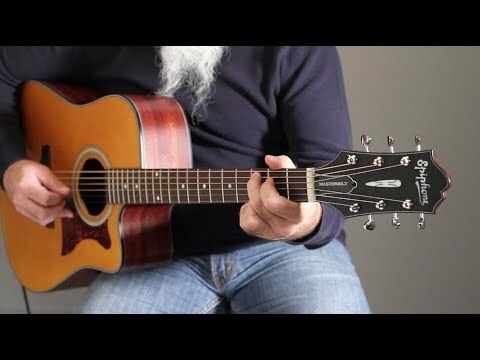 The DR-400MCE plays and sounds like a dream when performing "unplugged". Thanks to the built-in Shadow eSonic HD preamp and NanoFlex HD under-the-saddle pickup, the rich acoustic timbre is translated beautifully when you want to play through an amp. The preamp's sensitive controls are mounted in the soundhole for fast access, with master volume and master EQ with centre detent for intuitive adjustment. The Epiphone Masterbilt DR-400MCE Electro Acoustic Guitar in Natural Satin is perfect for players who want to step up from an entry level model, those who need a competent workhorse for gigging and recording with, and those who just want to kick back, chill out, and play on a sweet guitar. Every model is backed by Epiphone’s Limited Lifetime Warranty and Gibson’s 24/7/365 customer service.